Asylum Insidious In an era of the cigar market where the boutique brands seem to finally be receiving the attention they deserve, one name that keeps coming up is Asylum. Created by Tom Lazuka and Christian Eiroa (of Camacho Cigars fame), Asylum Cigars takes advantage of Christian's vast experience in the cigar world, creating blends with unique flavors and affordable price points. As many are aware, Asylum gained a following for fans of larger ring gauge cigars, often incorporating cigars with ring gauges larger than 60 and even going as far as the monstrous 7' x 70 cigars found throughout their lineup. 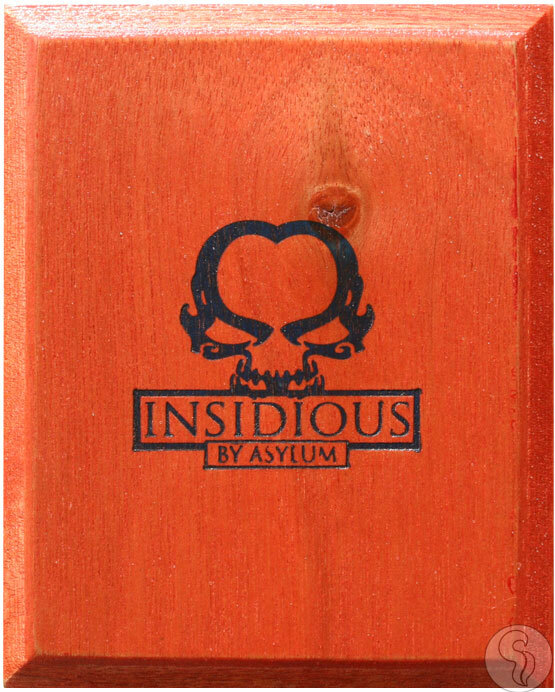 With their newest creation, Asylum Cigars aims to bring a sweeter side to these larger cigars with the new Insidious. The Asylum Insidious debuts with an Ecuadorian Connecticut wrapper and Honduran fillers and binder. And for the sweet spot? The cigar features a sweetened/infused cap, which offers just the right touch of sweetness, not being too overbearing and making for the perfect medium bodied smoke to enjoy at breakfast, dessert, and any time in between.